A place of rugged and austere beauty, with long-cherished artisanal traditions and seldom-seen masterpieces of art and architecture, the department of Aveyron is the enigmatic heart of the country. I had never been seduced by Pierre Soulages. His paintings fetch the highest prices at auction of any living French artist, and the current president of France has called him the greatest living painter in the world. Soulages paints largely in black, and black art had always left me cold. But that was before I found myself one sunny morning in the Musée Soulages in the medieval town of Rodez, where the artist was born 95 years ago. The museum is a succession of five steel blocks meant to rust over time, both blending in with and sitting boldly apart from the red-gray stone of the town’s centuries-old structures. 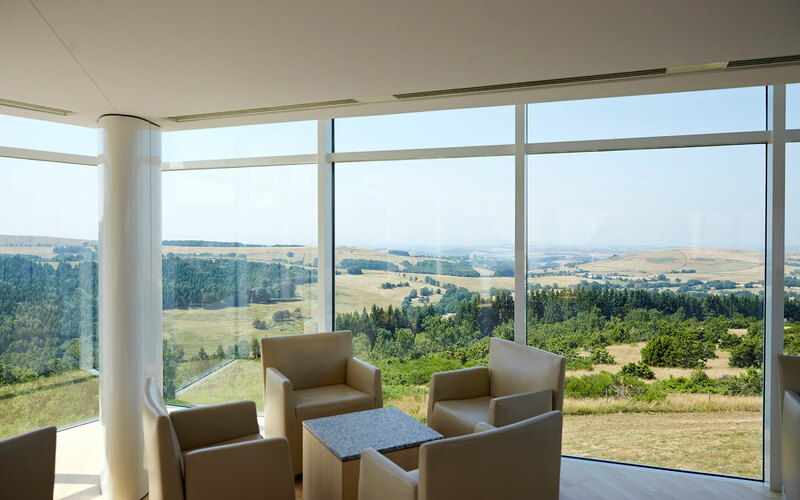 Inside, windows that rise to the ceiling offer views of the town and the hills beyond. Perched on a bench in front of a bank of windows, I came face to face with Peinture 162 x 724 cm, novembre 1996, a long, horizontal canvas. At first, it looked like much of the rest of Soulages’ work: dark. “Outrenoir”—or “beyond black”—he calls the style. That is the sort of revelation you might encounter in this place. The mesmerizing interplay of proportion and light is a fitting backdrop for 500 works by one of the 20th century’s most intriguing and least understood abstract painters. 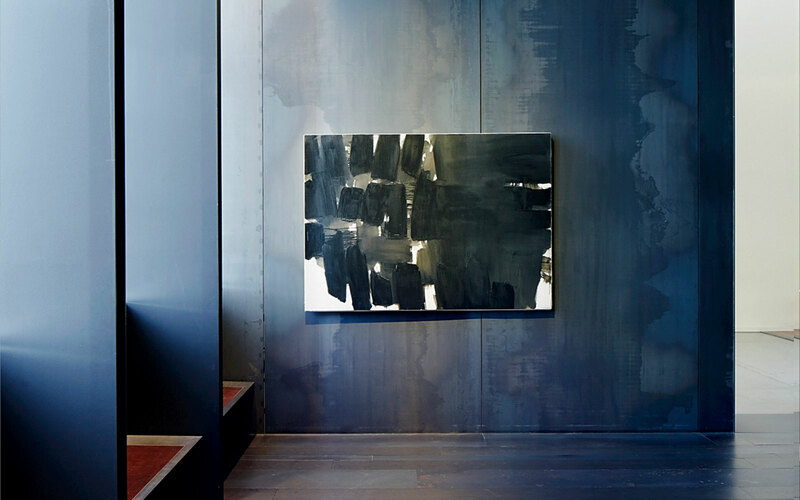 It is also a perfect entrée into a fascinating part of France, for Soulages’ paintings are a metaphor for Aveyron itself: starkly beautiful, rich with surprises, underappreciated by most Americans. Like the artist’s austere strokes of black on canvas, Aveyron demands patience before it reveals its secrets. My first knowledge of the region came in Paris, where I’ve lived for 13 years. The Aveyronnais, as its inhabitants are called, moved to the capital en masse in the 1850s and made their mark in the food industry and as retailers of coal and wine. They still own or run thousands of brasseries and cafés in and around Paris. The Costes brothers, who run the Costes restaurant-hotel empire, come from Aveyron. 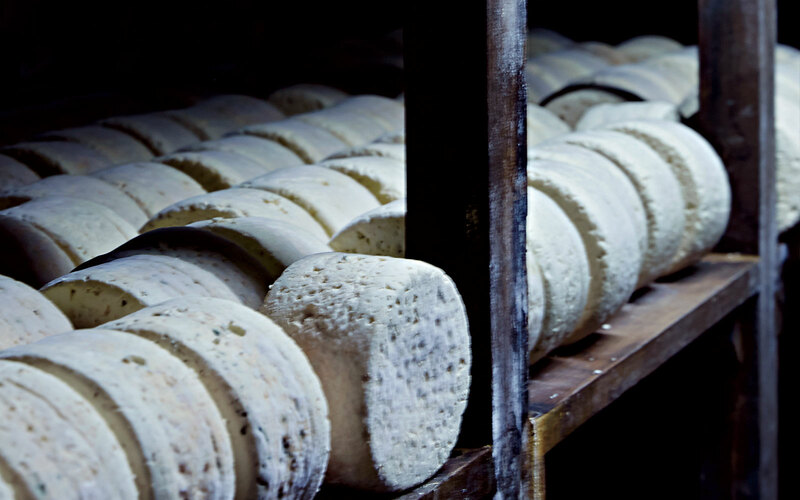 And I knew, of course, of the region’s long tradition of artisanal expertise: The caves of Roquefort-sur-Soulzon produce one of the most famous cheeses in the world; Aubrac cows produce some of France’s best beef. Craftsmen in Laguiole still forge their famous knives by hand; glove makers in Millau hand-sew gloves with the same care they did a century ago. Yet Aveyron itself is arguably the least known part of France: sparsely populated, hard to get to, and little touched by globalization, even though it is one of the largest French departments (more than twice the size of Rhode Island). Scarred by invasions, wars, and conquests, it was for centuries a poor farming region that even the Industrial Revolution could not transform. Those who didn’t leave were determined both to preserve what they had and to keep away outsiders. Even today, no high-speed train goes to Aveyron. This is not Provence or the Loire Valley, where house after house is inhabited by retired Britons, where village squares have been prettified into banality and weekend food markets mean traffic jams. This has allowed the region to retain the quiet beauty of another era. Part of southern France’s Massif Central, a huge elevation formed by fire and ice, it stretches over a varied landscape of plunging ravines, volcanic moonscapes, rolling hillsides, hot springs, peat bogs, deep caves, and farm pastures in a spectrum of green. 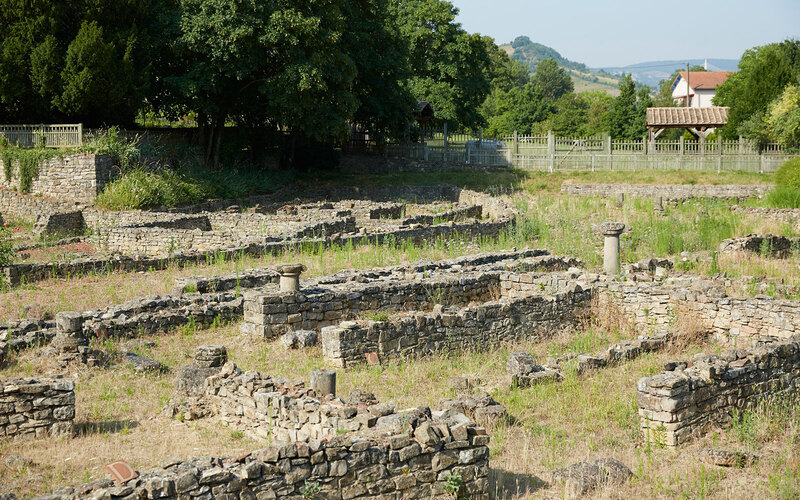 Visitors step in and out of historical and geological eras: Gallo-Roman ruins, castles straight out of fairy tales, 13th-century walled towns, and some of the finest Romanesque architecture in Europe. It is a land not of large cities but of small villages—some atop hills, others glued to hillsides. This is not Provence or the Loire Valley, where house after house is inhabited by retired Britons, where village squares have been prettified into banality and weekend food markets mean traffic jams. In Aveyron you can wind your way along narrow back roads—some barely wider than one lane, forcing motorists into languid slow motion—and trace an indulgently leisurely path through seldom-visited villages and countryside. And by the end, you will feel as if you own this swath of France. My husband and I started the trip in Rodez, the department’s largest town with about 24,000 inhabitants. After the opening of the Soulages Museum in May 2014, 300,000 people visited it in the first year. And they now have more reasons to linger: The museum’s bistro is by culinary giant Michel Bras, Aveyron’s other famous native son, who has a Michelin-starred restaurant in the region. 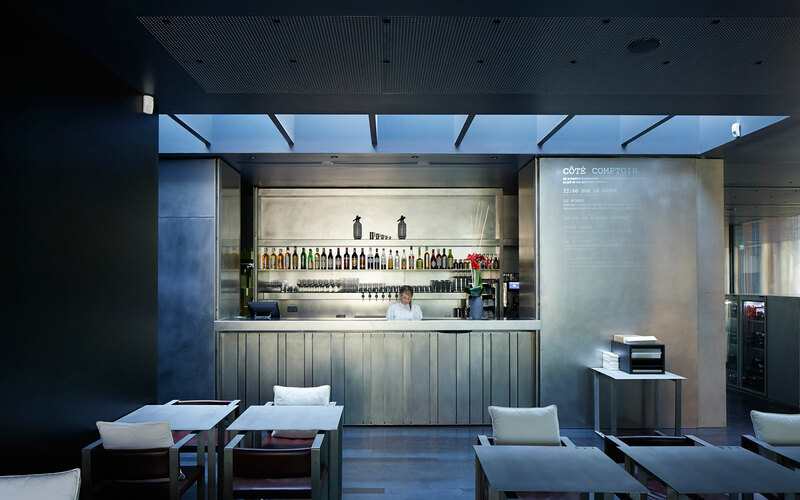 It’s a bright, airy space where the servers wear black and white in homage to the painter. And there’s Café Le Broussy, with its classic Art Nouveau architecture, on the cathedral square. The pink sandstone cathedral, darkened by the ravages of time, is almost as tall as Notre Dame, in Paris. Begun in the 1200s and finished three centuries later, it has a Gothic bell tower that rises almost 300 feet and is topped by a sculpture of the Virgin Mary. Nearby is the Musée Fenaille, which has 300,000-year-old fossils, along with relics from the Gallo-Roman era, the Middle Ages, and the Renaissance. I was struck by the 17 carved-stone menhirs: the largest collection in Europe of the first sculptural representations of the human form. One of the menhirs, the mysterious mouthless Lady of St. Sernin, has hands, feet, dots for eyes, small circles for breasts, two necklaces, and markings on her cheeks that could be scars or tattoos. We seemed to be the only foreigners at the Sunday morning market in Marcillac, in Aveyron’s wine country. Locals were passing the time in outdoor cafés and buying food for Sunday lunch. Butchers sold cured ham in huge blocks and half-inch-thick slabs. Bakers beckoned with free samples of fouace, a round, heavy brioche perfumed with orange; farmers sold homemade cheeses and raw milk in bulk. The smell of deep-fried farçous, a concoction of bread, eggs, onions, milk, chard, garlic, and parsley, filled the air. Much of Aveyron is protected land—if not by regional parks, then by conservative farmers whose bounty supplies the local tables and markets. You pass their pastures as you go from village to village. Elsewhere, ravines and rivers offer hiking, rock climbing, horseback riding, rope swinging, and hang gliding. In the early morning, heavy fog clings to the foothills, wrapping the landscape in mystery; at night, the pollution-free skies are so clear that stargazers can see the contours of the Milky Way. Sitting high above the Dourdou River is the walled village of Conques, a medieval jumble of small houses, a few narrow lanes, and fewer than 300 people. 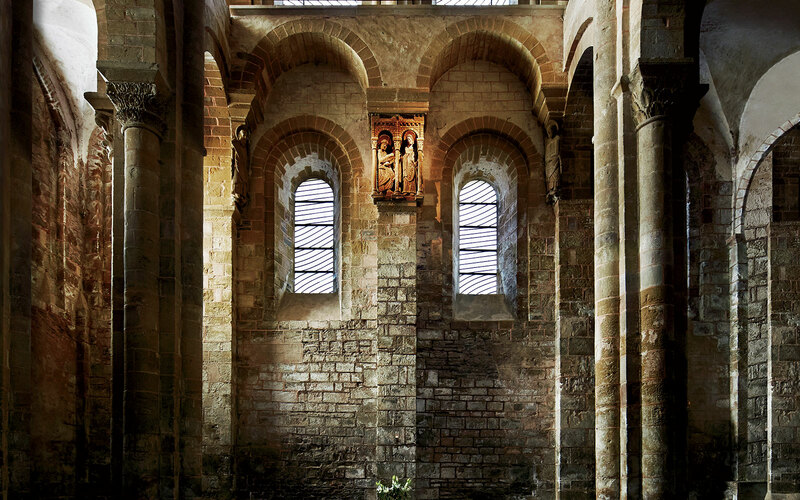 Conques’ main draw is the Abbaye Ste.-Foy, a magnificent Romanesque structure with a large semicircular frieze above the entrance—a sort of medieval comic strip carved in stone—depicting the Last Judgment. Over here are the joys of heaven (with prophets and saints) and the horrors of hell (with gargoyles and demons). Over there, the sinners, including a bare-breasted adulteress and a liar whose tongue is being cut off, fall into eternal hellfire. Since the Middle Ages, the abbey has been a major stop on the Santiago de Compostela pilgrimage route that wends its way through France to Spain. It also holds one of the most important collections of medieval and Renaissance goldwork in Western Europe. A gold reliquary contains a skull fragment of the third-century martyr Sainte Foy, a girl who was convicted, roasted on a grill, and decapitated by the Romans for refusing to renounce Christianity. It was here that, as a young boy, Pierre Soulages said he experienced his first “artistic emotions” and decided to devote his life to art. In 1994 the abbey installed 104 windows of his design—a series of striped panels, no two the same. They change color with the time of day and with reflections from outside, casting the church’s brooding artworks and relics in ever-shifting patterns of light. It was a strikingly similar experience to looking at Peinture 162 x 724 cm. 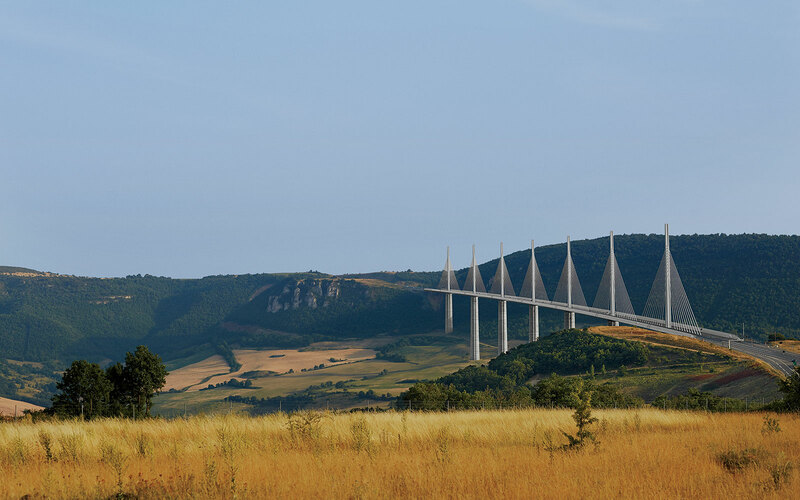 Aveyron boosters thought the region might take off once before, with the opening of the Millau Viaduct in 2004. Taller than the Eiffel Tower and longer than the Champs-Élysées, it is a delicate web of steel and concrete, and a triumph of engineering and imagination. Sweeping 11⁄2 miles across the Tarn Valley, it dominates the skyline. 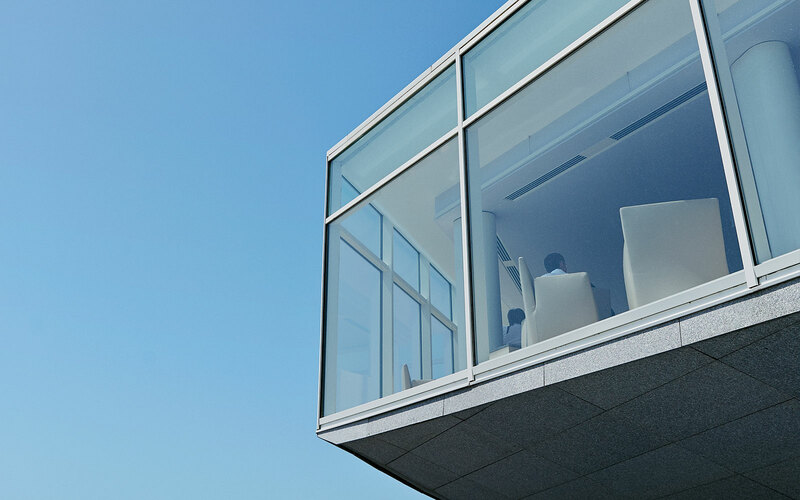 Its architect, Norman Foster, and its engineer, Michel Virlogeux, used lightweight, high-tech materials to give drivers crossing the bridge the feeling of flying. From afar, the bridge’s thin white suspension cables blend so naturally with a blue sky that when the sun is right, the cables magically disappear, one after the other. But it’s an older kind of craftsmanship that Millau is known for. Until the late 1960s, the town was the French capital for the manufacture of kid gloves, producing 4 million pairs a year. Now, only a few glove makers remain. I went to visit one of the leading houses, Maison Fabre, a fourth-generation establishment that still uses a 90-year-old press. One of the artisans, Christian Canillac, showed me the atelier where he stretches and pounds kidskin until it is as supple as silk, and where seamstresses cut, embroider, and sequin each pair by hand. Maison Fabre has made gloves for Dior and Nicole Kidman (when she portrayed Princess Grace, herself once a customer), and the showroom stocks hundreds of models, from the simple (I picked up an olive-green suede pair for $60) to the sublime (a prune-colored elbow-length model with python fringe and red suede inserts). Another famous Aveyronnais product is the folding Laguiole knife, from the town of the same name in the rock- and lava-filled Aubrac plateau to the north. At the family-owned Coutellerie de Laguiole Honoré Durand, artisans pound, fire, and forge sheets of steel into blades, and shape horn and wood into elegant curved handles in view of any casual visitor. Every knife is stamped with the Honoré Durand name and comes with a free-repair guarantee. But because the name Laguiole is not patented, anyone can use it—like “herbes de Provence”— and Coutellerie de Laguiole maintains a small exhibit of counterfeits from places like Pakistan and China. And there are rituals to learn: When the head of the family clicks his knife closed, the sound means that the meal has come to an end. A Laguiole knife is like a toothbrush; it is never lent to others. And it is bad luck to offer a knife as a gift; it must be “bought” with a coin in exchange. Ten minutes from the Coutellerie de Laguiole is Michel Bras’ Le Suquet, Aveyron’s only Michelin three-starred restaurant. Bras learned his craft not from a famous chef but from his mother, Angèle, who opened an inn and restaurant with her husband, Marcel, in 1954. At a time when French chefs were becoming stars, Bras earned a reputation as the silent chef, almost pathologically shy, passionate about foraging and cultivating wild roots, leaves, herbs, and flowers. Plants like nettle, dandelion, and mugwort became part of his repertoire. Bras’ son, Sébastien, who has been working in the kitchen since he was a teenager, took over in 2009 from his father, now 68. And as a tribute to Angèle Bras, her version of aligot—a dense, impossibly stretchy purée made by slowly stirring a local cheese into garlic-heavy mashed potatoes— is still offered at every meal. The restaurant, with its small ho- tel, looks like a metal-and-glass spaceship hovering precariously on the edge of a cliff over the Aubrac plateau. It’s a cinematic setting—cocktails with a 360-degree view of the countryside. And it’s enormously popular. 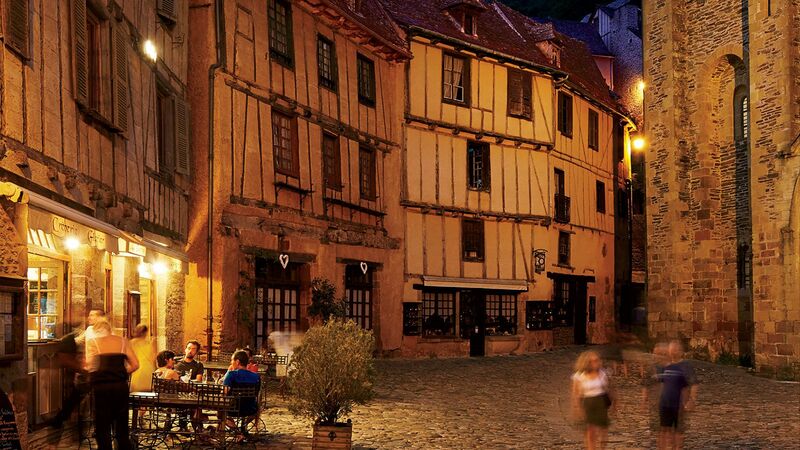 Both the restaurant and the hotel are booked long in advance, with a clientele that is only 20 percent non-French. The food is exquisitely beautiful, and a vegetarian’s heaven. One signature dish, the gargouillou, is a burst of color, texture, and taste made with 50 varieties of flowers, herbs, seeds, leaves, and barely cooked vegetable drops. After dishes of such delicate and intellectual, rather than sensual, pleasure, I admit I was left with a hunger for authentic local cooking—for beef from golden-hued Aubrac cows, tripoux (vegetable-and-herb-infused sheep innards), and truffade (a pancake of sliced potatoes cooked in goose fat and mixed with tome fraîche cheese). A food critic friend had told me about a woman named Colette who runs a small restaurant in Cassuéjouls, not far from where we were staying. We arrived unannounced at Chez Colette in the late morning. The restaurant was on the town square, which consisted of a small church, a war memorial, a row of chestnut trees, and a field for playing boules. Six locals were sitting outside drinking red wine sweetened with crème de cassis. The tasting whetted our appetites for the lunch that would follow at Chez Marinette, up a narrow, winding, not-for-the-timid-motorist road past small vineyards in Le Fel (population 156), 45 minutes away. The detour to Colette’s meant we arrived nearly an hour late for our reservation. Diners seated at tables outside were just finishing their lunch. Marinette Mousset, who is 81, sat at a table inside the entrance, peeling fat garlic cloves. I pleaded with her to receive us. All I wanted, I said, was to try her roast chicken, reputed to be the finest in the region. She relented, insisting we start with homemade foie gras garnished with poached pears and fig compote. The chicken arrived, its skin a translucent, deep gold. Thick sauce formed yellow- and caramel-colored pools on the platter. I ate it with a glass of 2011 Domaine Mousset, a wine made from Mansois, Cabernet Franc, and Cabernet Sauvignon grapes by Marinette’s nephew Laurent Mousset. The ground here is laced with volcanic stone, and the wine had an intensely powerful flavor and aroma. I hadn’t experienced a Proustian moment of memory before then. But with one sip, I was transported back to my childhood in Buffalo, New York, to my grandfather’s kitchen table. I was drinking the same tannic, volcanic wine he made every summer in our backyard. He stored it in barrels in the basement, and served it in small, short-stemmed glasses. I still have several of those glasses, and it gives me great pleasure to drink from them.